Fourth-year Madori Spiker dribbles past a Williams player. Spiker hopes that she “left her legacy” as head coach Amy Reifert puts it. Spiker wishes that the younger classes take away how much the fourth-year class cared about each other and about soccer. Soccer and school were a part of Spiker’s life but she believes that it shouldn’t be all of life. “Building relationships that are lifelong is something that I will remember of my time at UChicago. The senior class for sure is a bond of friendship that is unbreakable.” Spiker continued by saying, “You are not defined by your playing time.” To most athletes, playing time is the most important thing. For Spiker, soccer is not simply a sport of individuals, but a team experience. Spiker’s collegiate career unfortunately ended with a tough loss in the National Championship, but she sees it as something that makes her stronger. 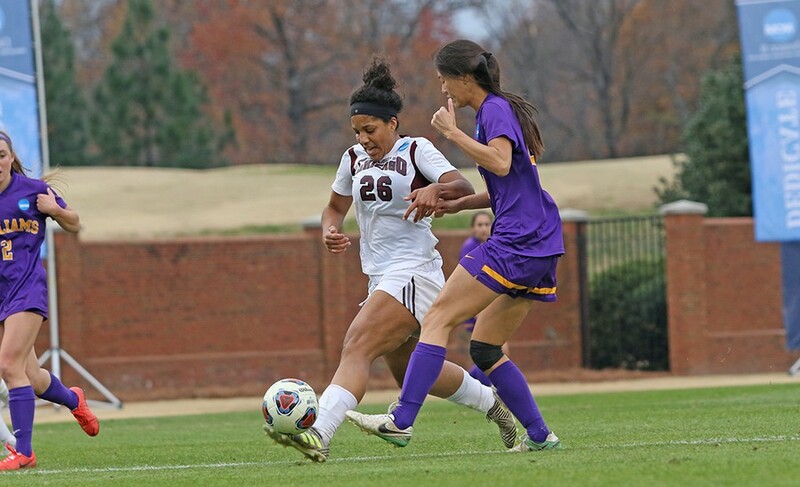 “Losing the National Championship was tough and losing soccer in general was even tougher. But, going forward it is something that made me stronger,” she said. Spiker went on to joke that she regained soccer this quarter by forming an intramural team with her fellow fourth-years on the soccer team. Spiker could not thank her mother enough for how much of a “driving” force, literally, she had been in her life. She describes how her mom would drive her to select soccer practices an hour away from her home in California every day. Aside from her family on the field, her family back home acted as a sounding board. “My brother is someone that I look up to, even though he is younger than me. He kept reminding me how much I love the sport and my teammates when I considered giving up.” Spiker’s brother will attend the University of Washington in the fall as a football player. Spiker is one of those rare athletic talents on the field who is an even more amazing person off the field. The fourth-year majors in biology while also finding the time to be active in the admissions department and in her lab. Over the past few summers, she has participated in the Doris Duke Conservation Scholars Program at the University of Washington. Spiker will continue her conservation research at the University of California, Santa Cruz next year.